This week is a strange one. One of my dreams has started to come true. Today, the people secretly indicted by Robert Mueller turned themselves in, revealing that major members of the Trump administration may very well have committed serious crimes against the United States. A lot of us have been waiting for this moment, and it’s just the beginning. I’ll continue to hope this cascades into something great; otherwise, this is a good start. 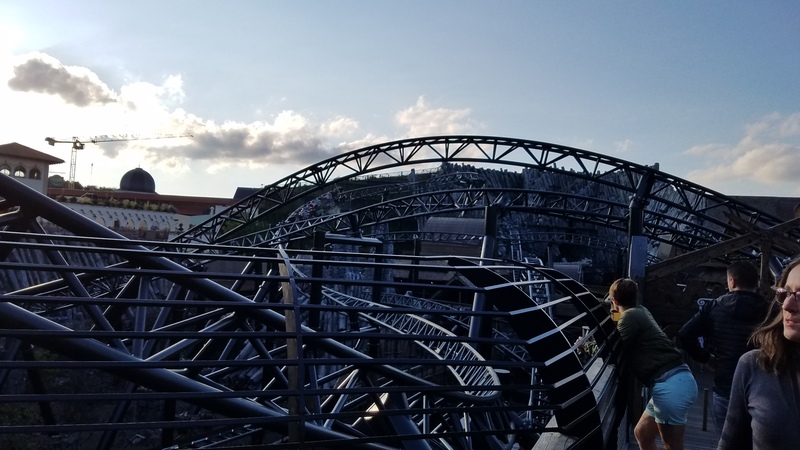 That, folks, is Taron in Phantasialand (Brühl, Germany). I’ve wanted to ride this rollercoaster for well over a year, but I figured it would never happen because of just how difficult it is for me to travel around the world. But I managed to swing it with some very careful planning, and in the end, I got to knock something off my very long bucket list. The ride is also fantastic, by the way. It’s like riding on the back of a dragon or a very large snake with an attitude problem named Phillip. It currently sits on my list of the top five rollercoasters of all time, and I don’t see it moving anytime soon. Also: apparently if you spend the entire ride screaming “woooooooo,” German teenagers will stare at you like you’re crazy. In the grand scheme of things, riding a rollercoaster doesn’t seem like much, but sometimes even fulfilling the smallest dream can do wonders. For me, amusement parks (and rollercoasters especially) are my way of totally removing myself from the stresses of life. For 1-2 glorious minutes, I am free, screaming my head off in pure delight. Nothing can touch me. Nothing else matters. Just that moment. Just those thrills. Going to Phantasialand offered new versions of that experience. And it was awesome. Beyond dreams, I’m also taking a break from Stephen King’s IT to enjoy some other things. Lately, I’ve been playing the crap out of Grim Dawn, a Diablo-esque RPG. My friend bought me a copy for my birthday, and I’ve become slightly obsessed. While it’s a fairly straightforward game in a lot of ways, it does allow for a surprising amount of customization. I’m currently rocking a Demotionist + Arcanist (a.k.a. a Sorceress) with heavy emphasis on explosive effects and AOE. It’s an interesting build to play, and I’m curious to see how it works as I continue to level up. If you’re playing the game, hit me up so we can play together! Space whales, y’all! Thus far, it’s not so much strange as weirdly familiar. I’ve never read it before, so it must be the framing of the narrative. I’ll have more to say when I finish the book! Hopefully, this new reading experience will be a good one. What are you all consuming? Let me know in the comments. My goodness, that rollercoaster looks like fun! It has been far too long since I did anything like that. The book does sound intriguing. Do you know if it was translated? I’ve just finished a fantasy romance and am about to get started on the rules for the new edition of the Paranoia RPG. My usual gaming group will be playing this weekend. Taron is a blast. Phantasialand has a lot of great rides, actually. Even the ones that aren’t that great are sort of like old Disney rides; you love them for the nostalgic feel. The book is only in English, as far as I can tell. It’s probably hard to find outside of random used copies :(. Also: awesome on RPing this weekend! Did you ride the Geister Rikscha (Asian themed ghost ride), while in Phantasialand? That one definitely falls into the “nostalgic appeal” category. They also had a similar ride with a western theme, but that one fell victim to a fire several years ago. Actually, yes! It’s apparently an uncommon ride format these days. Very strange, but quite interesting. I rode quite a few of the older rides while I was there just for the sort of Germany-Disney feel :P.
The Geister Rikscha is apparently the last surviving Anton Schwarzkof ride in Phantasialand, since the fire destroyed its two Schwarzkopf coasters. And Disney style theme rides were never much of a thing in Germany, which is probably why I like the theme rides at Disney World so much. Geister Rikscha is one of the few exceptions.